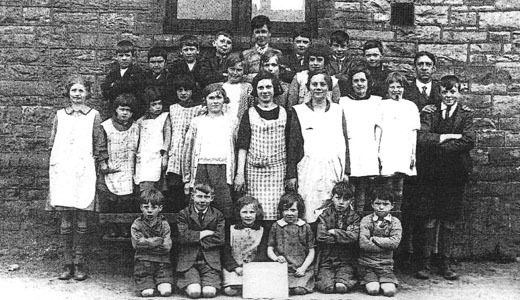 Ffynnon-Gynydd School was opened on 3rd July, 1876 and the children paid 4 pence a week. There was just one classroom until 1895 when a second classroom, with a wooden partition dividing the 2 classrooms, and a cloakroom were added. There was obviously no running water as the Headteacher was still requesting a supply of mains water in 1942. Hot dinners were not provided until the building of a canteen in the same year. The children went home at mid-day as the break was extended by half an hour, from 12.00 – 1.30 p.m. , one hour not being long enough for the children to make it home and back. They were often warned about non-payment and sent home to collect their “school pence”. The first teacher was Miss Holden who stayed until the Christmas holidays began on 22nd December. She was replaced by Miss H. McLellan, an uncertificated teacher who received her certificate in January 1878. 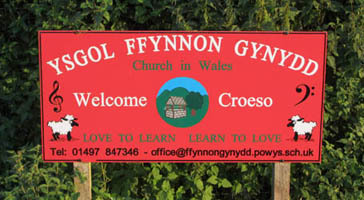 On Ffynnon Gynydd common, above Glasbury in Radnorshire, there is a small primary school. Built in 1876, it has two main classrooms and an adjoining house originally used by the schoolmaster. It is close to the ancient St Cynidr well and serves the families of nearby houses and farms. There is no one left to describe the school in its Victorian period but one or two erstwhile pupils remember their schooldays between the two world wars. George Powell helped his mother, the caretaker, to carry buckets of eater from the well across the common as there was no running water. Sometimes it was impossible to cross from the road to the school without being “over shoe tops in water and mud." Once inside it was bitterly cold in winter and on occasions the ink was still frozen in the inkwells at the end of afternoon school, this despite fires which were kept going all day. Central heating was eventually put in during the 1930’s. There being no water main, a header tank was installed in the corner of the large room as high as possible and was filled by hand off a ladder. The water was heated by a coke fired stove and if the caretaker lit the stove early or it had been kept going gently all night, the water would soon boil and the steam would blow water through the safety pipe into the header tank with a great gurgle. According to the log book the school had to be closed for an average of almost three weeks a year through epidemics of measles, whooping coughs, influenza or impetigo. Since in those carefree days children also had days off for the Hay fair, Harvest Festival and permission to beat at pheasant-shoots or to feather poultry, continuity of education must have been a problem. The rigours of the three R’s were varied by occasional outings like a day visit to Aberystwyth, a trip greatly enjoyed by the children, none of whom had seen the sea before. Less thrilling, but perhaps they relieved monotony, were lectures from outsiders like Miss E Rowlands who paid her promised visit this morning and gave a very interesting and instructive address on Tuberculosis. It is a visit which is always looked forward to by the children, who listen with marked attention and evident appreciation and great benefit. Out of school events included an annual Christmas party at Maesllwch Castle given by the de Winton family. George Powell says that there was always a lavish tea; sometimes a conjuror and very child received a present. Mrs Bates taught needlework and cookery and, conscious of the fact that most of the girls were likely to “go into service”, one of her lessons was to lay the table properly using the correct cutlery. It was the cookery classes that were the treasured memories of Rhoda Hughes who was at the school from 1920 – 31. She had enormous respect for this teacher who she remembered clearly and in 1999 she wrote this short essay about her.
" Through the ages there have been outstanding Christian people – St Peter, William Wilberforce, Florence Nightingale, Elizabeth Fry, the Polish priest, who in World War 11 in a ghetto exchanged his life with a younger family man. To these there are the stained glass windows, plaques, headstones etc, but the one that stands out in my memory is a school mistress and her husband who came to a small Welsh village in the depression when poverty was rife. There were children who were hungry and cold and often had wet feet when they arrived at school. They would eat their dinner sandwiches on the way to school. They couldn’t concentrate. This teacher noticed this and prepared a meal for them - hot in the winter. The older girls helped. A farmer’s son would take down a quart of skimmed milk every day. A local farmer sent brown homegrown flour. The gardener from a local nursery sent surplus vegetables. During the summer people would send a few eggs. In winter most people kept a pig, a real treat was “pig-meat”. A cook from a gentlemen’s house sent dripping. It taught the girls to be resourceful and consider less fortunate people. Sadly this was not taught in some homes. She taught us to cook in her small kitchen. I still have the recipes of what we made with her. This was a help in later life. She said her reward was the look on our faces when we took our first creation home. My schoolmistress had courage, loyalty, humour, a clear mind. She still remains the ideal woman to most of her pupils. Her funeral service made us feel humble. The Vicar said it was a life well spent and also a time of rejoicing for this very good life. " That she was greatly loved by the children and scholars who have left, neighbours and friends was shown at the funeral at All Saints Glasbury, which was filled by them and by the large number of floral tributes which they brought. In 1940 she married John Hughes, tenant of a farm at Bredwardine, Herefordshire, which he later bought. Rhoda became the archetypal farmer’s wife and had nine children who she raised with conspicuous success. Busy as her life was she found time to attend to her creative talents. She designed and worked several large tapestries, two of which adorn the walls of Bredwardine church. The Vicar remembers that Rhoda used to phone him and ask him questions like “ Vicar Barnes, what is the New Jerusalem like ? “. Perhaps she knows now ! Opportunities today are very different for most children. Today’s pupils certainly enjoy a stable and lively education in a family atmosphere. The Inspector’s report for 1880 advised that the general efficiency of the school did not reach higher than “pretty fair”. Arithmetic was particularly weak – of the 11 children presented in 3rd and 4th standards 10 did not work out 1 sum correctly. 1881 : A new teacher arrived – Kate Rowlett. 1883 : November 9th, – register not marked. Only 15 present – most of boys away beating. 1884 : August A new teacher arrived, Tom Halstead. June 4th: Albert Price playing truant 2 weeks. Refused to come to school so his mother brought him yesterday morning with a rope tied round his arm. He promises not to repeat the offence in future. Inspector’s Report: “This school is steadily working its way to the front rank... manners becoming worthy of praise.... slatework of first standard; paperwork of second standard”. Inspector’ Report: Excellent in elementary subjects + English, Geography and singing by rote, +girls’ needlework. Creditable success under the circumstances. Reading fairly expressive and would have been satisfactory if the children were taught to speak more distinctly. Arithmetic perhaps the best subject. July 1st: holidays begin – school cleaned and coloured. 1st February – attendance down – boys beating. Feb. 17th- so many away with colds, sore throats that school closed for a week. Feb. 24th – reopened but still so few that school closed again for a week. New teacher arrived: Mr H. Humpherson. Attendance down in August – children mushrooming. Some boys are working, despite warnings that they should still be in school. List of absentees, varying from 5 – 12 weeks sent to the Attendance Officer. March 19th: Severe snow – lanes choked up and drifts of 3 to 4 feet. No children in school. March 24th: half day holiday for Band of Hope and Sunday School treats. April 30th: Closed for 1 month due to prevalence of Scarlett Fever and flu – by order of medical officer. Reopened 25th may with 20 present. Premises much improved...as a school is not only a place for instruction but also for the formation of right habits it is hoped that the Managers will receive the hearty support of the new master, when appointed...... Fair to average but arithmetic weak; reading and recitation need much improvement... handwriting satisfactory.. needlework fair... the practice of counting on fingers and by strokes should be discouraged”. Dec, 7th – severe storm - all wet through – clothes dried in front of fire. 22 present. 1 girl absent for 12 weeks reported to be attending a dame school. Dec. 18th – finish at 3.30 p.m so children can get home before dark. Jan 18th – closed for a week due to snow. April 27th – half day holiday for Eisteddfod in village. May 20th – holiday: sports etc. In Maesllwch Park to celebrate marriage of Walter de Winton. Attendance poor all week due to Hay Fair which is regarded by all in the neighbourhood more or less as a festival week. Little work done and few attend school. May 6th: attendance poor due to potato planting. Inspectors Report: “Suffers greatly from irregular attendance and sickness... after due allowance we cannot regard the results as satisfactory... marked lack of intelligence in every class.......Infants especially backward... impossible to recommend payment of special grant under Act 105...Condition of the school as a whole almost warrants a formal warning under Act 86. A new teacher, Thomas Amos arrived. There were 76 pupils on the register. He decided to award prizes to improve attendance and standard of work and visited parents in an attempt to improve attendance. His efforts seemed to bear fruit as there were 72 present for exams on March 8th; attendance to May was 53% - an improvement on the previous year’s 37% and the Inspectors’ Report was “much improved... still a lot to do but satisfactory progress in elementary subjects.”. July 6th – treat for all, plus neighbouring schools, in Maesllwch Park. A pupil teacher arrived this year – Edward Betts and in November attendance was 75%. However, Scarlett fever broke out and the school had to be disinfected. 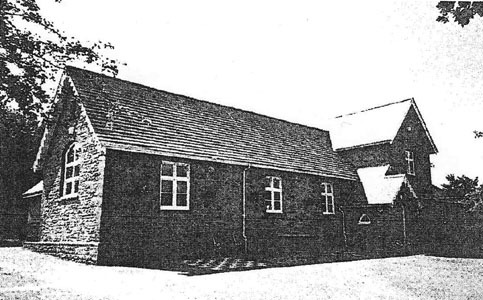 November 24th – Temperance Entertainment given at the school by scholars who had been formed into a “Band of Hope” – having given the same entertainment at Glasbury Assembly room the previous Wednesday. School disinfected 3 times by Inspector of Nuisance. January: severely cold – sewing had to be given up on account of very cold hands; children come in groups of 6 to warm but soon complain again and so process has to go on again whole of the day. Bad weather continued. Feb. 4th – severe cold. Thermometer registers from 2 to 4 below 0. Impossible to keep children warm and comfortable unless they sit by the fire. 1st March – still very cold. 15th April – attendance fluctuates this week on account of fairs, distribution of charity bread etc. 20th April - managers finally settled to build a classroom, cloakroom for the girls and reconstruction of offices. 30 April: end of school year – attendance 70.2 %. New year started on 1st May with 89 pupils registered. September: Scarlett fever at 1 farm, brought from Boughrood by a child residing there with grandparents. September 2nd: Opened school with 60 scholars present. School very much improved by the addition of a large classroom and cloakroom. Able to use the new rooms but the woodwork has not been painted yet. Intended to finish things this week. 18 October – attendance low – children picking potatoes and apples. 25 October – more cases of scarlet fever and diphtheria. 30th October – children dismissed early owing to Bazaar in the Assembly Rooms in aid of school building fund - £105 raised. 4th November – all the boys will be absent due to the shoot – used as “stops” to prevent pheasant etc. running out from covers. 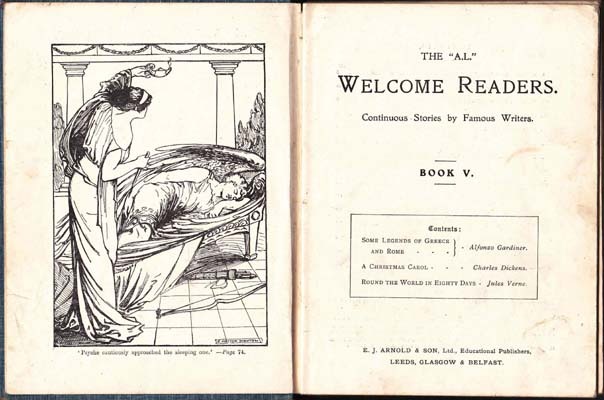 26 March – children attended a lecture on temperance in the Assembly Rooms so no school until 1.00 p.m.
14 April – closed for a week – measles in every home. Attendance at the end of the school year – 67.4%. Inspectors’ Report: No great improvement. Managers must have pigsty and fowlhouses removed from yard and placed at a good distance away from schoolhouse and playground. Sept. 7th – treat for children at Maesllwch Castle at 4.30 p.m. – tea, cake, buns, tarts, sweets and apples. Also present: Violet and Lola de Winton, Mrs Griffiths, Miss E Battiscombe, Mrs Nott, Miss Lloyd. Oct 30th – pupils with diphtheria. Nov 3rd– Lizzie Lewis died last Sunday of diphtheria. Teachers and Scholars sent a beautiful wreath. She was an exemplary scholar – teachers and scholars were very fond of her. 88 on register – 46 boys and 42 girls. Inspectors Report: hampered by want of desk accommodation. Handwriting not above fair, some poor. Spelling weak in 3rd and 4th standards and reading in 1st. In other standards reading too mechanical; grammar fairly good. Recitation and needlework fair. 28 May – Edward Betts’ last day. 22nd June – Diamond Jubilee – pupils let out at 1.30 p.m. and marched down to Maesllwch Park; tea provided as well as sports and prizes. Children sang, accompanied by Glasbury Brass Band. Every child in parish under 15 received a jubilee medal. 13 July : Gwen Lewis, scholar in the 3rd Standard died very suddenly last night about 11 o’clock from a fit. She had been absent from school during Monday afternoon, minding her baby brother. About 8.30 p.m. she and her little brother, Pryce, were sent to Glasbury to fetch some articles from the shop. On the way home she had the fit. Her father who had gone to meet the children carried her home. I went immediately on a bicycle to Hay for Sister Hinks but she was dead before she arrived. She had a fit in the cloakroom on whit Tuesday by coming in to school at 9.00 a.m. She did not seem any the worse for that as she preferred to stay in school rather than go home. She was a dear, sweet child. Friday, 16th July: All the children attended the funeral of Gwen Lewis today at 4.00 p.m. Attendance has been very good and so has progress but a certain gloom hangs over the school this week on account of the sudden death of one of the little scholars. 3rd Nov – many absent picking blackberries and elderberries. 1 Dec – shooting. A great deal of irregularity is caused during the winter months by the gentry taking the boys out with them on this shooting excursion. 4 Jan – treat given in assembly room by Col. Rhodes of the Castle – tea, cakes, crackers and oranges and magic lantern entertainment. 7 Jan – children gave entertainment in Assembly Rooms raising £3. Fallen off very considerably in attainment since last inspection and now in a very backward state... unless great improvement be effected next year the school will be declared insufficient. July – attendance poor due to hay making. 7 Oct – many absent picking potatoes, apples, blackberries etc. Have spoken to parents several times but as often as they want the children they keep them at home. 21 Oct – deputation of teachers to wait upon Hay Attendance Committee on 3rd November to impress upon the Committee the importance of regular attendance and to suggest means of improvement. 21 April – many absent chiefly on account of taking care of their young geese. Improved and in a fairly satisfactory state of efficiency. Gwladys Ammonds – pupil teacher arrived. 9 Jan – rummage sale in assembly room in aid of school needlework fund. Inspectors’ Report: Elementary subjects in most respects satisfactory. No water on premises and no lavatory supplied. A sufficient supply of water must be provided for drinking and washing. Feb. 14th: School closed – very heavy snow storm. Feb 15th: Snow a foot deep and all roads filled with snowdrifts. May 4th: Attendance low. Several parents think they can keep the children at home as much as they like during summer time, especially after HM Inspector’s visit. August: An extra week’s holiday granted because of wet weather prolonging the harvest. Due notice given to HM Inspectorate. 11the Sep: Treat: The children enjoyed a splendid treat – 110 present – organised by the Vicar, Rev. Griffiths, Mrs Griffiths, Miss de Winton, Sir Francis and Lady de Winton. Games were indulged in: a scramble for apples, sweets etc. races etc. The children sang some songs and gave hearty cheers to the contributors. 10th Oct. – holiday for the general election. 12th Oct: attendance not so good – potato picking, blackberrying and acorn picking. 16 Nov: boys shooting – they get 1 shilling a day which enables them to get a new pair of boots or a suit of clothes for winter. 30th Nov: Surveyor visited school and took level distance from the well to the school: Height of school floor above well 27.5 feet Distance from well 170 yards There is now every prospect of getting water supply at an early date. Over £20 obtained by entertainment and jumble sale for that purpose. May 1st: Cottage gardening commenced today as an extra subject. The boys delighted with the new occupation. Good progress during the past year and now in a satisfactory state of efficiency Many of the desks are old and not very suitable for teaching purposes. 4th Sept.: Treat – now an annual event. School photograph in 2 groups. 11th Oct: medical officer advised closing school and said we should have closed at the first appearance of whooping cough. 3 little children have died during these 3 weeks. 23rd May – Holiday; the late Miss de Winton’s funeral. The teachers and scholars sent a wreath in affectionate remembrance of the many kindnesses received from this good lady. She was a subscriber to the school and very kind to the children. Considerable difficulties owing to sickness which affected attendance. In spite of this drawback work is very satisfactory..... Cottage gardening taught with much success to older boys. 26th June: holiday for the coronation. Intercessional service in church and tea and sports in Maesllwch Park. 1st Sept.– measles; school closed for 1 week. 6th Oct. – Fires lit. The weather is very cold. The children having had the measles lately are naturally rather tender and many attract severe colds. 17th Nov. – Had a request from Cpt. De Winton for 25 boys to act as “stops” on Tuesday, Wednesday and Thursday. The children were provided this holiday instead of Coronation week. The boys get 1/9 per day for this, and that money helps the parents to get new boots and clothes for the winter. Only the best boys are asked to go. 24th Dec. – Will not give any Christmas holidays, only Christmas Day and Boxing Day. It is much better to give the children a holiday when the snow is deep, or when the gentry require stops. 3rd Jan. – The Christmas tree was given at Maesllwch Castle last Saturday; over 100 children present. They had tea, cakes etc. and 2 or 3 presents from the tree. Oranges were distributed when the children left for home. 1st June – Holiday - Whit Monday – Foresters week and sport in Maesllwch park. 24th June – Holiday – eisteddfod in Glasbury. 29th Sept – last day under old management – transfer tomorrow to the County Council. 30th Sept – new management, new registers. 9th Oct – Treat at All Saints Vicarage. Mrs Griffiths goes around the wealthy parishioners and asks them to give something towards the treat. When all is brought together it forms an excellent meal for the children. The teachers and scholars greatly appreciate the kindness of the donors. 16th Oct. – The new managers held their first meeting under the new Education Act at the School at 4.30 p.m. The necessary repairs and improvements in accordance with the County Surveyor’s report where ordered to be carried out. 21st March – whooping cough. 21st July: holiday – king and queen visited county to open the Birmingham Waterworks in the Elan Valley. School continues to be satisfactorily conducted... Arithmetic is well taught.... Staff not sufficient to satisfy Article 105 of Code of 1903. 26th Sept. Measles epidemic – closed for 2 weeks. 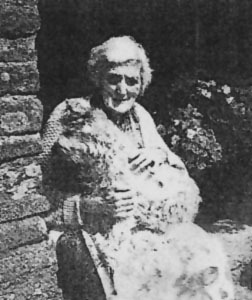 Oct, 3rd – Agnes Mary Lyke – pupil teacher started. 15 May – Charles and Nestor Lewis left today for California where their father resides. Children and teachers presented them with a knife each as well as 3 shillings each to purchase whatever they liked. The children felt the parting very much. Very satisfactory state of efficiency. Hard work suffers from want of suitable exercise books. July 27th: Scarlett fever broken out in Cwmbach in the house of Mr T Lloyd and Lily Lloyd, a pupil at the school, is ill with the fever as well as an uncle living in the same house. A grandchild of Mr Lloyd, Charles Smart, came on a visit from Pendarren and previous to this visit he had been in hospital with Scarlett Fever. He was also admitted into this school on 22nd. Feb 21st: boy sent home with the “itch”; his mother came in and was told what to do. Feb 22nd – 4 sent home suffering the “itch”. 31st March – several away with scabies, shingles and eczema. 14th July – The scholars are present with coronation mugs, the give of Mrs Morgan, Boughrood Castle. 5th Oct. – Nellie Holder, a child of 8 years, broke her collar bone by falling from the swing at 11.10 a.m. She was eating a per and was not holding to the wire suspenders of the swing. Dr. Jayne set the bone. Jan 14 – Cpt. and Mrs Synge brought 3 large tins of hot soup for the children at 12.30. 33 partook, each paying ½pence for as much as they could eat. They will come every Tuesday and Thursday in winter. They also supply basins and the children bring their own spoons. 28th Feb: attendance bad – children being kept by parents to carry firewood, the woods being now open for the cottagers to get firewood. 30th Jan. – the cooking van arrived and was fixed on the common near the school. 4th Feb. – Cooking lessons began today at the van. 12 is the full complement; there are included 3 from Llowes. Feb 23rd – School closed for 1 week owing to the death of the Headmaster, Mr W.J. Amos. May 25th: Henry Kerr Lupton commenced duties as Headteacher. 10th June – Holiday – children invited to coming-of-age festivities at Maesllwch Castle. Sept.11th: Miss Winnie Jones, Student Teacher, commenced duties. Nov, 19th: a farm labourer from Lower Pentre has for a long time been interfering with the children and swearing. Today I caught him and unmercifully thrashed him. 1. Frightened the children going home. 2. Run them right to the school door. 3. Used filthy language to the girls. 4. Bursted the boys’ footballs and broken the goal posts. 5. Sent insulting messages to me by my little daughter. 6. Insulted Mrs Lupton in the presence of scholars. 7. Shouted from a distance during drill lessons. I asked his master (Mr Lewis, Lower Pentre) to correct him 3 months ago. Apparently nothing has been done so to put an end to this nonsense I took the law into my own hands and thrashed him. Nov. 30th: Left school at 10.00 a.m. to attend court at Clyro. Phillips severely censured and warned by the bench. Jan. 11th : piano arrived. Feb. 24th: Infants’ room full of smoke; fire had to be put out and infants worked in the big room. March 29th: closed for 2 weeks due to measles. August 9th: Bessie Jones, Bessie Hobbs and Reggie Gardner are reported as having left to attend Hampton Grammar School. Sept. 13th: 90 pupils on roll. Nov. 8th: commenced cocoa club today for the winter. Each child pays 1pence weekly and receives a mug of cocoa daily. Nov. 29th: 9 girls attended the war time cookery lectures from Monday to Friday. Jan. 3rd: 85 on roll; 53 absent with mumps. March 6th: chimney pots have been put on and the difference is remarkable – there has been no smoke in school since. May 18th: Master received notice to report himself for military service at Knighton on 2nd June. May 24th: Empire Day – the vicar addressed the school and saluted the flag at mid-day. June 5th: Headmaster retained in military service. July 10th: Miss Harper commenced duties as Supplementary Teacher and has charge of the infants’ room. Oct. 2nd: School closed for 2 weeks due to impetigo on Doctor’s orders. Dec. 5th: School closed for the day to allow me to bring my little daughter home by car from Gloucester Hospital – as incurable (she had “infant paralysis”). Dec. 12th: Sent 7 shillings to the Overseas Club for Christmas presents for the soldiers – collected by the children. Jan. 9th: a holiday has been granted for the day as wounded soldiers are being entertained to a concert at the parish room and the schoolchildren are invited. Jan. 27th: Children very keen on War Savings Scheme. Feb. 12th: Headmaster discharged (returned 12th March). May 15th: Sent notes to parents about children being sleepy in school – I rather think that owing to the Daylight Saving Bill the children are late going to sleep. Very good work is done in this school. The special attention paid to local geography and history, the keeping of notebooks in several subjects, the correlation of gardening and drawing and the compositions of some of the older children deserve special praise. Much attention is paid to spelling...... average attendance ... the school is not as clean as it should be... washing pans out of repair and no drinking water on the premises. Oct. 1st: Wilfred Lewis, an old scholar here, has been awarded the DCM in France; Frank Amos awarded the Military Medal. Oct. 9th: Took 40 of the older children to Maesllwch Park to collect chestnut cobs for the manufacture of munitions. 8 cwts. collected. Oct. 11th: Second collection of chestnut cobs. Nov. 5th: Alice Haynes of the Green, Glasbury, commenced duties as supplementary teacher. Dec. 5th: 48 pairs of clogs arrived from Rochdale. Distributed to scholars at 7 shillings and sixpence per pair. Jan 22nd: Sent £4.2.6 to the “Weekly Despatch” for tobacco for Glasbury overseas soldiers – from the Concert Fund. Mar. 25th: Arthur Preece, 6 years of age, fell from a moving gambo and dislocated his collarbone... gave the soldiers who drive the gambo orders to use the whip on any scholars attempting to mount the gambo. June 18th: Children sent £1.18.0 to Overseas Club for tobacco for soldiers. Oct. 15th: Left school in charge of Miss Haynes this afternoon to lay charge of false pretence and larceny against a Russian called Kutsiouchenki at Hay Police Station. Remanded until 15th. Oct. 18th: Left school at 11 a.m. to attend trial at Hay. I recovered money and property. This prisoner sent to 3 months’ imprisonment. Dec. 20th: this school has won the banner for the 3rd year in succession – 1916, 1917, 1918. In lieu of the banner a library has been presented to the school. 64 pupils registered; the lowest in the history of the school. A highly satisfactory standard of work is maintained in the various subjects. Sept. 30th: Charles Jones, Pool, aged 10 years is being employed by... I wrote to no avail and reported the case. Oct. 27th: Charles Jones returned to school. 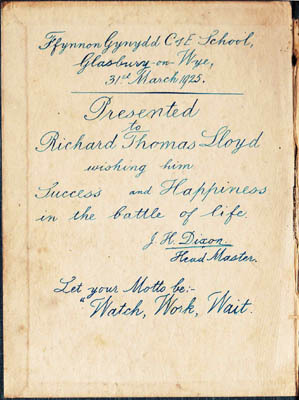 Feb. 23rd: Master called to Llandrindod to a special meeting. May 6th; Serious charges made against the late headmaster, Mr Lupton, and which after an enquiry by the Managers and the Clerk to the L.E.A. , led to the resignation of both Mr and Mrs Lupton, since the latter could not stay after her husband left and which unfortunate occurrence has interfered with the school work for nearly a month past. Attendance now become normal after the considerable interruption caused. Sept. 14th: J.H. Dixon, CM, FRHS commenced as head and Blanche Jones as supplementary teacher. Sept. 21st: Nellie Haynes employed as student teacher. Oct. 8th: The longer I stay here the more I regret I ever came. Old, dilapidated premises, furniture, books, wall decoration, muddle of cupboards, scarcity of stationery are hourly very trying; adding to this the disgraceful paperwork and low attainment of the children and we have state of things which would induce me to resign at once, but for the fact that it has cost me £35 to remove here. Dec. 16th: I gave Mrs Evans permission to address the girls on the subject of Girl Guides with a view to forming a village corps under the superintendence of Mrs Synge. Oct. 14th: holiday today as a large number of scholars stated their parents intended to take them to see Broncho Bill’s Wild West Show at Hay. Feb.9th: The scholars desks are a daily source of anxiety lest some limbs should be broken ...... we have had to discard 3 and use slates instead of paper. Feb. 16th: wet weather continues. It is impossible to cross from the road to the school without being over shoe tops in water and mud. Dec. 13th: Visit of the Director who examined all apparatus and stationery – he burnt some and took away a quantity of useless and disgraceful books.... he promised to replace them at an early date. Feb. 11th: 22 dual desks arrived... it is a great relief to be able to put aside most of the old desks which are positively dangerous. June 2nd: admitted Arthur Hope, infant. June 26th: 35 scholars taken to Aberystwyth for the day. The railway journey and 9 hours on the shore were thoroughly enjoyed. The scholars took lunch with them and 2 meals were provided. The cost was 6 shillings per head – 2 shillings paid by children, 2 shillings from the Concert Fund and the remainder by the Church and Wesleyan Sunday Schools. It was the first time that any of them had seen the sea. July 14th: admitted Charles Lloyd. Jan. 22nd: annual treat at Maesllwch Caste. After a visit to the family’s museum the scholars were highly entertained for 1 hour by a conjuror, specially engaged for the occasion. An excellent tea was provided. Jan 12th: Construction of footpath commenced. March 4th: Misses Butler called in connection with the Boy Scout Movement of which they are scout and cub mistresses. Oct. 31st: the end of my school career of nearly 50 years. Nov. 1st: Mrs Laura Horton commenced duties with Blanche Jones and Vera Davies as temporary assistant teachers. Nov. 18th: Mrs Horton terminated today. Nov. 21st: Archibald Alfred Bates and Hilda Bates commenced duties, with Catherine Bond as supplementary teacher. Dec. 20th: very low temperatures – the ink in desks has been frozen all day. July 19th: Mr R. Fernie of the Lamb Inn lectured this afternoon to classes 1 and 2 on his voyage to and life in the Falkland Islands. Dec. 13th: workmen commenced the installation of heating apparatus. Jan. 28th: Col. and Mrs Clarke, Treble Hill, called with a gift of 27 books which they had finished with for the school library. ... much impressed with the excellent tone of the school. Jan. 16th: 2 scholars, Charles Bowen and Charles Lloyd, received certificates won in a competition organised by the Royal Sanitary Institute. March 31st: annual scholarship entrance exams held – 7 candidates. July 6th: Report of school entrance exams shows that Charles Lloyd, Doris Bowen and Edith Powell have passed and Charles Lloyd has the highest marks in the examination in English. July 14th: School closed for teachers to take children to Barry Island along with the Congregational Chapel Sunday School – all guests of our manager, Mr W.E. Bagshaw..
Oct. 13th: whole school marched to the road at 1.00p.m. and saluted the coffin with the remains of Mr E. Davies, the blacksmith, as it passed. Mr Davies was kind enough every year to allow our infant classes to visit his forge whenever the lesson on blacksmith came round. Feb.: Decided to reduce the staff to 2 teachers owing to the fall in numbers – now 48. July 8th: Headmaster took 11 boys to Hampton Grammar School to play a cricket match in which we were hopelessly beaten. This is the first match we have ever played and did our boys good. July 15th: Hampton School cricket team were our guests this afternoon at a match on the common. Our boys were much less nervous and played wondrously well. We lost by 32 after 2 innings, having beaten them well in the first innings. The moral effect is wonderful and has knit our boys together into a team with much esprit de corps. July 25th: took our cricket team to Hay to the Grove to play Hay C of E school. .
July 26th: School closed – 42 children to Porthcawl for picnic by motor coach at the invitation of Mr Bagshaw; the second year he has done this. June 6th: 62 children commenced tent making on the common. The tents are made of sticks and bracken... a custom dating back to the time of their great grandfathers at least. June 27th: Trip to Barry Island - all the children above 7 invited, along with the Congregational Sunday School – paid for by Mr Bagshaw. There were 100 children and adults. June 30th: Cricket match at Hampton School. 4th March: Supply of one third of a pint of milk to children at a cost to them of ½d daily commenced today. The milk is drunk after it has been boiled in school at 10.45 playtime. Some children bring their own milk and this is boiled separately. Mr J. Hope, New House Farm, has been appointed to supply the milk. 14 children have joined in this Government Scheme. May 6th: holiday for the celebration of the Silver Jubilee of King George V. Every parishioner was invited to Maesllwch Park for sports, high tea, fireworks and to the Begwyns where the Scouts lighted a bonfire at 10 p.m. Each child was given a mug, a brooch and a new shilling. July 5th: trip to Porthcawl. Nov. 16th: school closed as many boys beating for the shoot. May 12th: Coronation day celebrations in Maesllwch Park. July 15th: trip to Barry Island – expenses paid by the Trustees of Glasbury Fund, founded by the late Mr. W.E. Bagshaw. Nov. 7th: School closed for older boys to go as beaters to pheasant shoot; the boys get half a crown in payment and beat from 7.00 a.m to 5.00 p.m.
Dec. 21st: All children invited by Mrs De Winton to a tea party in the assembly room. The teachers arranged for a cinematograph entertainment after tea and provided crackers, oranges, sweets and a toy for each of the 80 children from a grant of £5 from the Bagshaw Trust fund. Sept. 4th: 2 girls, evacuees from Birmingham and London present. Oct. 26th: Admitted a boy, Norbert Pieber, a refugee from Vienna who speaks no English. May 27th: Norbert Pieber suddenly interned in the Isle of Man. Jan. 9th: 6 children evacuated from Bootle attended today. Jan. 17th: 2 more evacuees from Bootle. May 23rd: Another batch of children from Bootle. June 17th: 2 more evacuees. Aug. 4th: Men with tractors began ploughing the common to produce food. Sept. 14th: Erection of new kitchen in girls’ playground. It is a shed built of asbestos cladding, 15’ x 12’ with a coal burner, range, slop sink, pantry and concrete table. Nov. 11th: Hot dinners for children commenced today. 30 children partook at a charge of 4d per child. Headmaster wrote to RD Council asking for water supply to be laid on for the canteen and hand basins. A petition from the neighbours asking for water to be laid on at the same time. May 8 – 15: Salute Soldier week for Radnorshire. The amount invested in this school group is £1210. May 17th: Closed for Hay Fair. July 12th: 7 children and 1 teacher evacuated from Surrey. July 17th: 15 evacuees admitted. Sept. 3rd: Memorial service for Sam Price, Welsh Guards, killed at Caen – in all Saints Church. First of the old boys to make the supreme sacrifice. Oct. 2nd: Mr J. Morgan, new Headteacher. New head, Mrs Baynham. At the end of the first week of my appointment; the school is light and airy and has most of the things needed to make a thoroughly attractive school. A considerable improvement has been effected since the publication of the last report in 1951. Ffynnongynydd School closed its doors for the last time in 2012 after 136 years of educating the children of Glasbury. Ffynnongynnydd – the school log books lodged in Powys Archive in Llandrindod Wells.